"Came up with this recipe when I had over half a can of pumpkin puree left over when I made pumpkin cheesecake. Just added ingredients as I went. The berry and whipped topping flavor is instant, but you will start to taste the pumpkin after! Best served chilled." Preheat oven to 350 degrees F (175 degrees C). 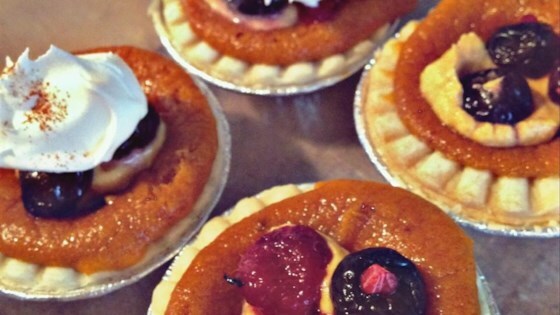 Arrange tart shells on a baking sheet. Combine pumpkin puree, whipped topping, sugar, vanilla extract, cloves, and nutmeg in a large bowl; mix well by hand for 1 minute. Spoon 2/3 of the pumpkin filling into the tart shells. Refrigerate remaining pumpkin filling. Bake in the preheated oven until filling starts to puff out and sag into the shell, 30 to 35 minutes. Let cool until set, about 1 hour. Place a dab of cold filling in the center of each cooled tart shell. Top each tart with some mixed berries, whipped cream, and a dash of cinnamon. Tarties can be served immediately but they taste best when served chilled.